Arrived on time and went right in and checked car in. Identified wheel lock which would be needed for tire rotation. Waited at dealer and it took 1.5 hours for oil change and tire rotation and systems check. Went for a new truck and had a great experience. They were quick with the paperwork and I was in and out after making the decision to buy, thank you Tudor, Jeffrey, and James! Working with Bob Navin was very easy. I am 90 minutes from this dealer but found a 2018 leftover with the features I needed there. Bob was very informative on the phone and I drove up the next day to look at it not thinking I could complete the purchase in one day so didn’t have everything with me I should have. Liked the truck and they improved on the previous trade in quote I had received. They made it happen so I could drive the truck home saving me another 3 hour round trip. While Bob cleaned my junk out of my old car, Dan gave me the run down on how the features worked and set up the technology. very happy! Fred and Evan made our experience of buying a car very painless!!! 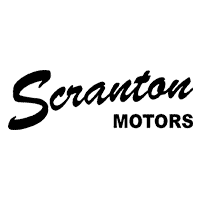 I would recommend this dealership to anyone. Very friendly, it was a piece of cake!! Being able to get most of the stuff completely via text and email made things very quick at the dealership. Today our leader is Meghan Scranton, third generation dealer and granddaughter of Larry. Even though he passed on years ago, we know that Larry would be so proud to know that his own granddaughter has grown up to be the YOUNGEST FEMALE GENERAL MOTORS dealer in the country. Meghan has taken his vision to include not only the employees of Scranton but the communities that surround our businesses.